In 2013, the French economy grew at an annual average rate of 0.3%, which enabled it to return to the level it had reached six years ago, in early 2008. Between 2008 and early 2011, the economy had shown resilience in comparison with the performance of France’s main partners. In the first quarter of 2011, the country’s GDP had even come close to regaining its pre-crisis level, and lagged only slightly behind Germany and the United States. But the situation changed in the second quarter of 2011 as the austerity measures introduced in 2010 began to have an impact. The initial spurts of recovery seen after the recession were cut off. While the country did experience positive annual GDP growth, until 2013 this was close to zero. Ultimately, France is leaving this six-year period behind with an increased deficit that is still greater than the threshold of 3 GDP points. Fiscal consolidation has not proved very effective: the cost in terms of activity, unemployment and the financial situation for business has been disproportionate to the results. In recent months, the economic situation in Europe has clarified considerably, with a return to growth and a strengthening of the main economic indicators. Business surveys also show a return of confidence in the productive sectors in France. The relaxation of austerity should enable the French economy to continue along this path, with growth in GDP gradually picking up pace in 2014 and 2015. For 2014, if we consider only the measures already approved, the French economy would grow by 1.2%, a level that is insufficient to bring down unemployment or to hit the 3.6% deficit target. The announcement by Manuel Valls in his general policy (“DPG”) speech on 8 April 2014 of additional austerity measures of 4 billion euros through a supplementary budget prior to the summer should allow the government to meet its deficit commitment. But this will inevitably hurt activity and reduce the growth expected for the French economy to 1%, bringing the unemployment rate to 10.2% of the workforce by year-end. The DPG speech is also upsetting expectations for 2015: prior to this announcement we had forecast GDP growth of 1.6%. Companies would benefit from this renewed growth to gradually restore their financial positions. This strategy is based primarily on increasing productivity, which would help to reabsorb marginal production capacity and restore business margins. In this scenario, the public finances would also continue their gradual adjustment and the government deficit would come to 3% of GDP. As a corollary to the announced adjustment, the unemployment rate will continue to rise in 2015. The acceleration of the implementation of the Responsibility and Solidarity Pact promised in the DPG speech and the vagueness about how it will be funded may well affect the scenario set out above. 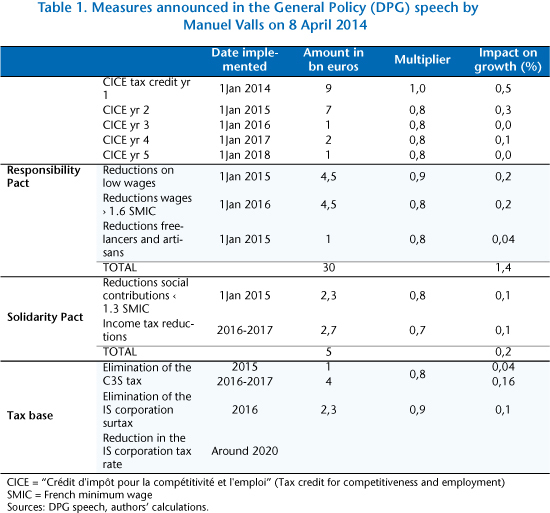 Without new measures to cut public spending other than the 12 billion euros already included in our central scenario, the injection of 8.8 billion euros in new measures (Table 1) would allow the French economy to achieve 2% growth in 2015, as it did in 2011. This growth, combined with the impact of reductions in social security contributions on low wages, would by the end of 2015 push the unemployment rate down to its end 2013 level of 9.8% of the labor force. The reduction in the fiscal stimulus to -0.1% of GDP, although partly offset by the impact of growth on tax revenues, will nevertheless take the scenario off the path set out by Brussels, with a public deficit of 3.2% of GDP. If new cost-cutting measures are taken to finance these new measures ex ante in 2015, then, given the higher fiscal multipliers for government spending, the positive impact on growth would vanish, and the general government deficit would surpass 3% (3.1% of GDP) and the unemployment rate would hit 10% at end 2015. This scenario appears worse than the central scenario with respect to public finances and growth, with the slight fall in the unemployment rate being due simply to the impact of reducing social contributions on low wages, leading to a larger proportion of low-wage jobs in total employment (Table 2). ← Euro zone: Recovery or deflation?